Looks fabulous, anyone would think we had been cooking in the same kitchen, we simultaneously posted caramelized onion and cheese blogs! Shame it didn’t have figs too. This sounds lovely – going to try it out over the weekend. One question though – when you say ‘blind bake with paper and beans’ – could you possibly extrapolate for those of us who aren’t experienced bakers please? An idiots guide to this bit of the recipe would be fab 🙂 Thanks! Oh they’re little garlic flowers, should have mentioned that really! I have them on the roof terrace (smells of garlic!) it’s a really pretty plant, like big chives!! O.K. the challenge is on (Hunger Games ) !! I take the ‘pop’ in the spirit it was intended, cos’ I know you love me really. beautiful tart. loved the cute lavender colored flowers and the lavender plate. 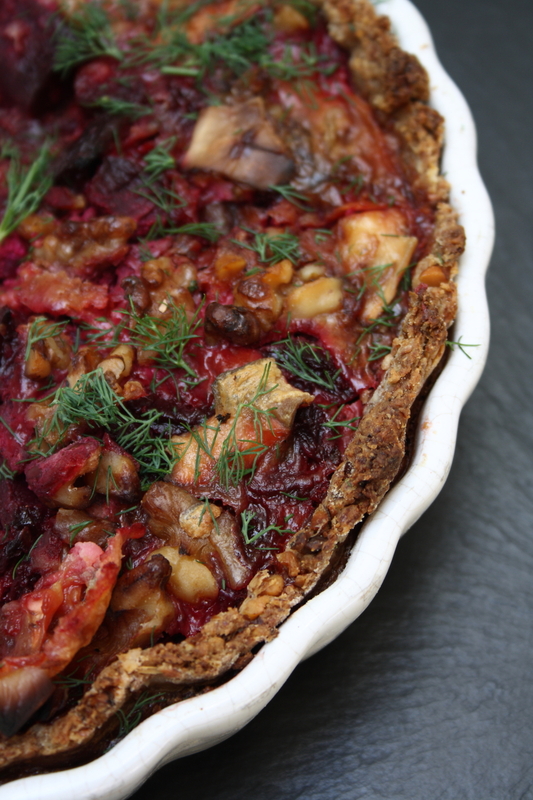 This is a lovely tart and I really want to try making the oil based crust. Delicious ingredients. I have garlic chives growing and see those little flowers but never thought to add them for color like that. Very cool. They are lovely in salads too, adding both flavour and prettiness to the final dish! What an utterly beautiful tart with incredible flavours. I love the sound of that pastry – so simple! This is such a beautiful recipe and it´s great to have an olive oil pastry recipe. It all looks as stunning as ever. Am intrigued by the oat milk – did you make it (if so, how) or buy it (where?) as I love it! Thank you! The oat milk is from Mercadona (I know) surprisingly it has no added anything, just oats & water and is €1.40 a litre. I use it in everything!! That´s good to know – will have to look out for it, thanks! This quiche sounds divine!! Also congrats on making Foodbuzz Top 9! My problem with figs is I usually eat them before they can make it into a dish! 🙂 What lovely pics and what a delicious quiche! Figs and feta – YUM! great idea – love figs and goat cheese! Can I make it and serve it on a regular plate or does it have to match that perfectly. OK, seriously, this is gorgeous all around and I need to make it. Plates be darned, I’m eating it out of the pan. Boy do I love figs! No the plate has to match and so do the cushions in the surrounding area, ok?!! this looks delicious! I have only had fig a few times, and each time was with goat cheese- I can only imagine how amazing this quiche is!! Lovely! And sounds like an awesome crust. Is it possible to use regular all-purpose flour? I just tried this recipe and is really lovely! However, the quiche was quite wet, so do you dry these in the oven first or what can i do? I blind bake the pastry case in the recipe above to dry it out first, that stops it getting soggy hopefully! !